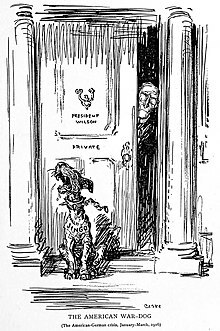 The American War-Dog, a 1916 political cartoon by Oscar Cesare, with the dog named "Jingo"
Jingoism is nationalism in the form of aggressive foreign policy, such as a country's advocacy for the use of threats or actual force, as opposed to peaceful relations, in efforts to safeguard what it perceives as its national interests. Colloquially, jingoism is excessive bias in judging one's own country as superior to others—an extreme type of nationalism. The term originated in the United Kingdom, expressing a pugnacious attitude toward Russia in the 1870s, and it appeared in the American press by 1893. The phrase "by Jingo" was a long-established minced oath used to avoid saying "by Jesus". Referring to the song, the specific term "jingoism" was coined as a political label by the prominent British radical George Holyoake in a letter to the Daily News on 13 March 1878. Probably the first uses of the term in the U.S. press occurred in connection with the proposed annexation of Hawaii in 1893, after a coup led by foreign residents, mostly Americans, and assisted by the U.S. minister in Hawaii, overthrew the Hawaiian constitutional monarchy and declared a republic. Republican president Benjamin Harrison and Republicans in the U.S. Senate were frequently accused of jingoism in the Democratic press for supporting annexation. British artillery major-general Thomas Bland Strange, one of the founders of the Canadian army and one of the divisional commanders during the 1885 North-West Rebellion, was an eccentric and aggressive soldier who gained the nickname "Jingo Strange" and titled his 1893 autobiography Gunner Jingo's Jubilee. Theodore Roosevelt was frequently accused of jingoism. In an article on 23 October 1895 in New York Times, Roosevelt stated, "There is much talk about 'jingoism'. If by 'jingoism' they mean a policy in pursuance of which Americans will with resolution and common sense insist upon our rights being respected by foreign powers, then we are 'jingoes'." In Homage to Catalonia, George Orwell decries the tactics of political journalists and wishes for introduction of airplanes into war in order to finally see "a jingo with a bullet hole in him." The policy of appeasement toward Hitler led to satirical references to the loss of jingoistic attitudes in Britain. A cartoon by E.H. Shepard titled "The Old-Fashioned Customer" appeared in the 28 March 1938 issue of Punch. Set in a record shop, John Bull asks the record seller (Prime Minister Neville Chamberlain): "I wonder if you've got a song I remember about not wanting to fight, but if we do … something, something, something … we've got the money too?". On the wall is a portrait of the Victorian Prime Minister Lord Salisbury. ^ Catherine Soanes (ed. ), Compact Oxford English Dictionary for University and College Students (Oxford: Oxford University Press, 2006), p. 546. ^ ""By Jingo": Macdermott's War Song (1878)". Cyberussr.com. Retrieved 12 March 2012. ^ "By Jingo". Davidkidd.net. Retrieved 12 March 2012. ^ Pears, Edwin (1916). Forty Years in Constantinople, The Recollections of Sir Edwin Pears 1873-1915 (1 ed.). London: Herbert Jenkins Limited. p. 27. Retrieved 10 June 2016 – via Internet Archive. ^ McCarthy, Justin (1881). A History of Our Own Times: From the Accession of Queen Victoria to the General Elections of 1880. IV. London: Chatto & Windus. p. 473. Retrieved 14 March 2018 – via Internet Archive. ^ Holyoake, George Jacob (1892). Sixty Years of An Agitator's Life. II. London: T. Fisher Unwin. pp. 216–218. Retrieved 14 March 2018 – via Internet Archive. ^ Martin Ceadel, Semi-detached Idealists: The British Peace Movement and International Relations, 1854–1945 (Oxford University Press, 2000), p. 105. ^ Kansas City Times, 14 February 1893, p.4 editorial: "Jingoism pure and simple." ^ Strange, Thomas Bland, Gunner Jingo's Jubilee, London, 1893; new edition with an introduction by R.C. Macleod, Edmonton, 1988. Macleod, R.C., "Thomas Bland Strange," Dictionary of Canadian Biography. ^ "For An Honest Election" (PDF). New York Times. 23 October 1895. Retrieved 30 September 2012. The reference is found halfway down the article. ^ Orwell, George (1938). Homage to Catalonia. ^ Charmley, John (1999). Chamberlain and the Lost Peace. Ivan R. Dee. p. 61. ISBN 9781461720928.